The drywall plaster is suitable for interior walls. The 12,5mm thick gypsum boards are stuck to a solid base with quick drying bonding gypsum ADERTEK. Rough wall could be furred without any substructure, clean and quickly. The homogeneous bonding gypsum, mixed with water is piled in lumps on the wall or on the gypsum boards. After that the boards are pressed to the wall and are leveled using carpenter’s level and lute. 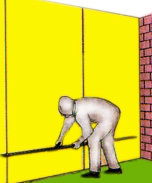 The height of the walls should be measured and the boards should be cut 2-3 cm shorter. The wholes for the installations should be marked and cut off. 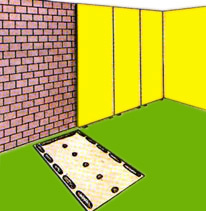 For leveling of the boards to a needed distance from the wall a line, marking the outline of the wall is, drawn. The mixed bonding gypsum is piled over the wall – ribbon-shaped for the longitudinal edges and in lumps for the middle of the boards. The bonding gypsum is mixed in a rubber hod. 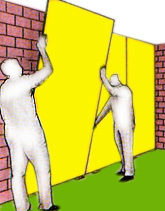 Immediately after the gypsum is set the board is put on the wall – always should begin from one of the corners and, if possible, from a wall with no windows or doors. The front edge of the boards is leveled to the floor. With carpenter’s level and lute the board is pressed perpendicularly to the wall. The same things should be done with the next board. At the end should be checked whether the two boards are on the same level. The vertical line should be checked too and the boards should be leveled on the diagonal with a lute. No more then 10 minutes after the bonding gypsum usage the knocking and the leveling of the boards should be finished. In case with fireplaces the bonding gypsum should be spread over the whole surface. If there are any doors or windows, the boards are cut out and are also stuck over the whole surface. The protruding angles should be protected with aluminum or galvanized perforated angle profile.